Welcome to the May 18, 2009 edition of the Carnival of Genealogy. The topic for today's edition is: Honoring Mothers. You'll meet all sorts of mothers in this beautiful collection of writings. These stories will touch your hearts and remind you of the special relationships people have with their mothers, grandmothers, and the other mothers in their family's history. We're a little late for the Kentucky Derby but what the heck. Pour yourself a Mint Julip, set out a nice picture of your own mother to gaze at, and then read on and meet the mothers we honor here! Dorene from Ohio presents Doris Wheeler posted at Graveyard Rabbit of Sandusky Bay, saying, "My maternal grandmother, Doris Wheeler Parker, died when she was only in her early thirties. Even though her life was short, she touched many people along the way." Kris Plausky presents CoG 72: Mothers Present, Mothers Past posted at From the seed to the branches. M. Diane Rogers presents Mother's Day - 1914 - Manitoba, Canada posted at CanadaGenealogy, or, 'Jane's Your Aunt', saying, "Mothers' Day in 1914 in Manitoba, the year my mum was born, seems to have been an occasion for reflection and remembrance." Greta Koehl presents My Mother, the High School Graduate posted at Greta's Genealogy Bog, saying, "Today we tend to take educational opportunities for granted, but it was not an easy accomplishment for the child of a poor farmer to earn a high school diploma when my mother was growing up. I will always admire Mom for "going back to high school" and getting her diploma." Lucie LeBlanc Consentino presents Mama and Me posted at Acadian Ancestral Home, saying, "When I was a little girl, I thought there was nobody more wonderful and special than my mother who we fondly called "Mama". This blog is about growing up with Mama." Midge Frazel presents Taking Care of Mom posted at Granite in My Blood, saying, "I am fortunate to have two 4 generation photos of mothers and daughters in my collection. Women in my family live a long time but often need to be taken care of in their old age." Linda Hughes Hiser presents Carnival of Genealogy 72nd Edition--Mothers posted at Flipside, saying, ""Always a daughter.....now a friend" was a special framed saying that Mom gave me one year for Christmas and it was so, so true." Nikita presents Thanks Ma, I Miss You! posted at Musings of a Mad Macedonian, saying, "My 2008 Ma Day Post shared my Favorite picture of my Mom, and of my Parents together, my thoughts on my Mom, a link to a story I did about my ongoing research into one of my Great-Grannies, and a link to a writing exrcise good for not only only writing about your Mom, but your roots in general." And, Finding Aunt Golda posted at Musings of a Mad Macedonian, saying, "This is a 3 part story about a woman who never became a Mother, one who had the love of a husband, and some, but not all, of her family, how she became lost to that family, for 45 years, until 1 member got curious, and went looking for her." Judith Richards Shubert presents Missing Mildred posted at Genealogy Traces, saying, ""Missing Mildred" is a tribute to my step-mother, the sweetest, most dedicated Mom a girl could have!" Brenda presents Mother's Day posted at Brenda Dougall Merriman, saying, "Every mother is special. Do we appreciate and understand them, flair, flaws and all?" John Newmark presents 72nd Carnival of Genealogy: Mothers posted at Transylvanian Dutch, saying, "A portrait of my mother drawn 35 years ago"
Janet Iles presents Janet the researcher: Carnival of Genealogy - Janet Love nee Johnston posted at Janet the researcher, saying, "Janet remembers her maternal grandmother as a hard worker. She did take time for family picnics." Jasia presents Saying Goodbye to My Mothers posted at Creative Gene, saying, "Mothers come in all shapes and sizes... sometimes even in a shape you might not expect. Curious? Come read about my Motown moms." Stephanie Lincecum presents Southern Graves: Cindy posted at Southern Graves, saying, "My Aunt Cindy was one tough lady. The phrase "cuss like a sailor" fits her well. Yet, her words to me were always kind. She taught me so much, and I want you to love her as much as I do!" Apple presents Apple's Tree: Anna posted at Apple's Tree, saying, "I have learned so much about my family as I transcribe letters. Most were written to Sarah Ann Camfield Carlisle who was called either Anna or Annie. While I'm learning about what is going on around her I'm not learning nearly enough about her." 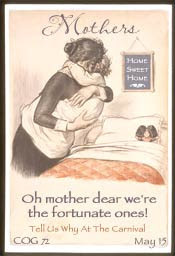 Stephanie Varney presents Honoring The Mothers of Irish Genealogy posted at Irish Genealogical, saying, "A blog entry about the importance of honoring our Irish mothers, along with a personal story about my own Irish great-grandmother, Margaret Ellen Dillon." Donna presents Chicken Soup for My Soul posted at What's Past is Prologue, saying, "Donna Pointkouski's Mom is Donna's personal chicken soup for her soul. And thanks to Mom's actual chicken soup, Donna will be back to blogging soon!" footnoteMaven presents There Will Be No Readheaded Children posted at footnoteMaven, saying, "She was called on to protect her way of life, her home, and her family against great odds. And she was to succeed." Barbara Holz Sullivan presents Making Do: A Tribute To My Mother posted at View From the Bluffs, saying, "Making Do: A Tribute to My Mother's Resourcefulness". That concludes our collection of writings. I'm honored to have met and learned about the moms featured here today and I'm sure you are as well. Thanks to all who have contributed to this edition and to those who promote the COG on their blogs and social networking sites. I appreciate you! And now we have a Call for Submissions! The topic for the next edition of the Carnival of Genealogy will be: The Good Earth. Were your ancestors sharecroppers or land barons? Perhaps an ancestor was a logger or a miner. Do you have stories of homesteading? Is there a master gardener in your tree? If your ancestors lived in the city did they keep a square foot garden or escape the city to a favorite park? Tell us about your family's ties to the land! The deadline for submissions will be June 1st. Apple will host the next edition of the COG on Apple's Tree. Thank you so much for hosting the COG, Apple! Thanks for the COG poster, fM!